Puppy HenryMy long-time faithful reader Sara Brandenburg writes, "Can you give Henry his much deserved attention...for More Puppy? 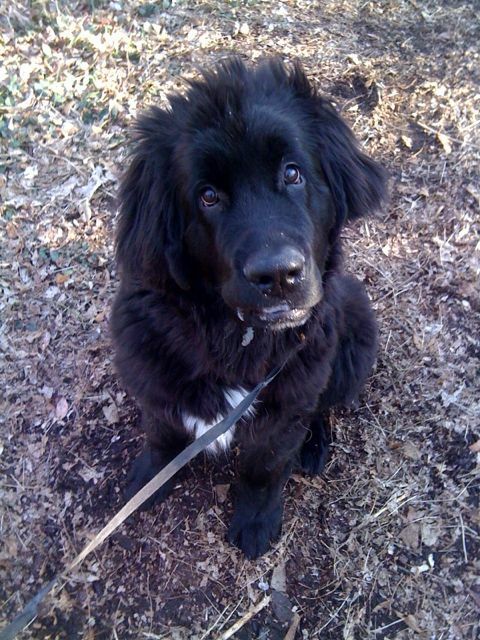 "My young man Henry is so much for a sweet 10-month-old Newfoundland. I won't lie, he can be such a pill! 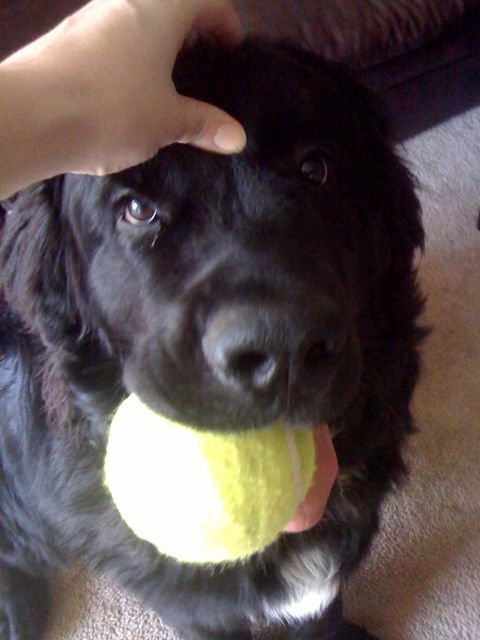 He daily spills his water on the kitchen floor, once when upset over being left behind for the day he scratched a hole in the wall, and at 100 plus pounds I still have to lift him into my suv, but on May 3rd he saved my life. "My apartment building has been power washing/spray painting the last few days and using a generator for power. For whatever reason they put the generator inside the Henry on a hike: Afraid of heights,but safe between Mama's legsapartment right below mine - running - and quit for the day. 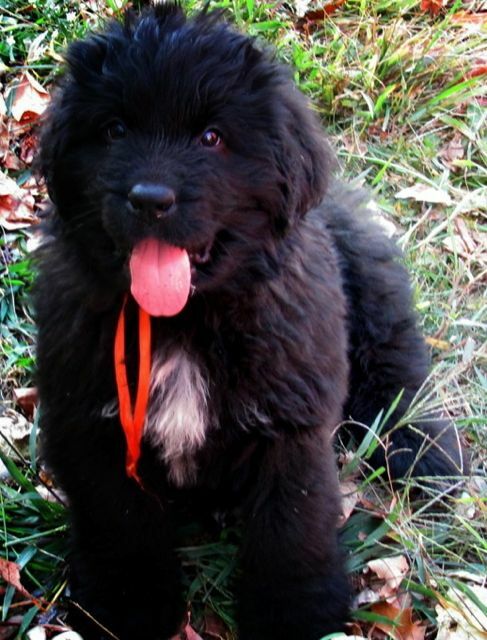 "Henry acted more and more silly as the evening came, standing and barking at me. Wanting to go outside over and over again, making me drag him inside. Barking and barking and barking at me. Taking the cover off my bed as I laid down for the night. Laying on it when I tried to get it back. (Not his typical at all.) I ended up locking him up in the bathroom for being naughty. He kept barking and scratching at the door. I tried to ignore him. If that's not adoration - a little man (who luckily was with grandparents and not home) and his dog! "I was so aggravated at him, my goal was to be asleep by nine, I had to work early the next day, but he kept bothering me. I couldn't sleep with him acting up. I walked him again, and then drug him back in the apartment with all my might and aggravation at him when he bit me. He didn't draw blood but it hurt, maybe more so my feelings than anything. I slammed my bedroom door in his face giving him the apartment to roam but he still wasn't satisfied. He ran from one door to my room to the other. He mouthed the door knob. It was at this point I started worrying about him. Was he sick? Did he have something like rabies? What was making his personality so different??? "I got up and sat on the side of my bed, trying to decide what to do. Somewhat confused but I felt as though it was from exhaustion and my wonderful dog losing his friggen mind. Hurry up with the pic already! I have some 'splorin to do! "And then it happened. A alarm shreaked from the living room. I jumped thinking fire and then noticed it was the carbon monoxide detector. It was sooo loud. I was thinking, moving slowly and wasn't real sure what to do. I called 911 for advice and they rushed over. Levels were so high in my apartment once they arrived I was told I'd have been dead in 20 minutes or so. "I since underwent carbon monoxide poisoning treatment, as have my beloved dog and cats. If Henry had allowed me to fall asleep, I'm not sure with the white noise machine and the effects of the carbon monoxide I'd have been woken by the alarm. Had it not been for him there is a huge chance I'd fallen asleep as planned at nine and slept through the 9:40 alarm. There is a huge chance I'd be dead. Henry and his reward for saving my life--I know it's not much but he loves it! "I've been saying for months he's special, and he is for so many reasons. But I'll never forget the day that somehow he knew something wasn't right, we were in danger, and despite being punished and locked out and yelled at he kept doing everything he could to save me. Rooting on his favorite team...sorta...woohooo go cats!